Like its baby brother for the iPhone, Pocket Informant HD for iPad is an impressively panoptic app. The $7 productivity and time management app from Web Information Solutions encompasses feature-rich calendaring to-do list tools, in an attempt to turn your iPad into a true personal information manager. Much like Todo for iPad, Pocket Informant HD employs a near photo-realistic view of Franklin Covey-esque notebook. The app works—and looks—great in both portrait and landscape orientations, but I found that I consistently preferred the wider landscape view, since it exposes more options at once. And the app offers just an insane amount of settings—but not in an overwhelming way. More on that later. Today’s the Day: Pocket Informant HD’s Today tab gives you a filterable, list-based view of what’s on your agenda for the day. On the syncing side, Pocket Informant HD’s calendar can sync with Outlook (via a separate, free download) or Google Calendar. (The developers provide instructions if you prefer to sync with iCal, but you need to do it through a third-party utility that syncs iCal with Google.) My initial Google sync worked fine, with a couple of caveats: After the initial sync, the app crashed, though it had successfully imported all my events. Far more annoying was the fact that the app scheduled two reminders for all my events with alarms. Speaking of alarms, since the iPad isn’t yet running iOS 4, with its “local” push notifications, getting your reminders from Pocket Informant currently can only work if your iPad is online. Web Information Solutions promises that as soon as the iPad supports local notifications, they’ll be enabled. 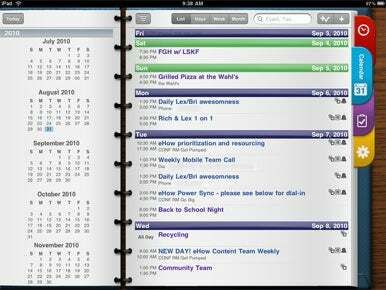 Pocket Informant HD’s task management features are as robust as its calendar offering. You can choose to use from three to-do list styles: GTD, Toodledo, or Franklin Covey. Just as in the iPhone version of the app, you can sync your tasks with the Toodledo Web site, and you can attach all kinds of metadata to each task you create: tags, status, due date, importance, recurrence, alarms, and so on. As a Google service-devotee, I wish Pocket Informant could sync with my Google Tasks, but that feature request aside—the app’s task management offering is exceedingly robust. You can find another great shortcut in this section of the app, too: When you type in the search bar to filter your task list, if you don’t find a match, you can tap “return” to create a brand new task instead. It’s quite convenient. The app is jam-packed with settings and interface niceties to let you customize your life-management tools to your liking. Tapping on any entry lets you convert it into something else (like turning a task into an appointment, for example), and also provides options to delete the item, e-mail it to a friend, or edit it. Instead of just tapping that edit button, you can tap and hold on the element you’d like to edit—like, say, the appointment time—and you’ll jump straight to that section of the edit screen. Pocket Informant HD truly seems eager to help you, and excels at doing so. The app manages to address anything you might want to do, regardless of what screen you’re on, without feeling overwhelming. I was continually impressed by this. I liked the iPhone version of Pocket Informant, but I didn’t love it. Its broad functionality felt a bit fussily cramped on the iPhone’s small screen. On the iPad, everything feels a bit better designed and flows more naturally. I haven’t touched on oodles of features the app offers—TextExpander integration, the ability to e-mail/import backups between iOS devices, and more. If you carry an iPad and feel like your life could benefit from organization, Pocket Informant HD is definitely worth a look.